I grew up in a tiny town in central Illinois. Peoria was the closest city with things to do (like shopping, buying groceries, eating at chain restaurants, meeting boys other than the fifteen I had known since kindergarten…) and quite often we would eat at Avanti’s. Avanti’s is an inexpensive Italian restaurant with several locations in Peoria, East Peoria, Pekin and Normal (near ISU). We ate there as a family growing up and my friend Leah and I would go there almost every weekend throughout high school and college (when we were home for the summers). Avanti’s bread is sort of famous in the area. It is a sweet Italian bread that is something dreams are made of. It makes a perfect treat to sop up Avanti’s red sauce, it makes a tasty garlic bread and it’s probably most famously used to make a gondola: a sub with mayo, lettuce, ham, salami and American cheese. It’s a taste memory so clear that I could still taste a gondola, even though I hadn’t eaten one in years. 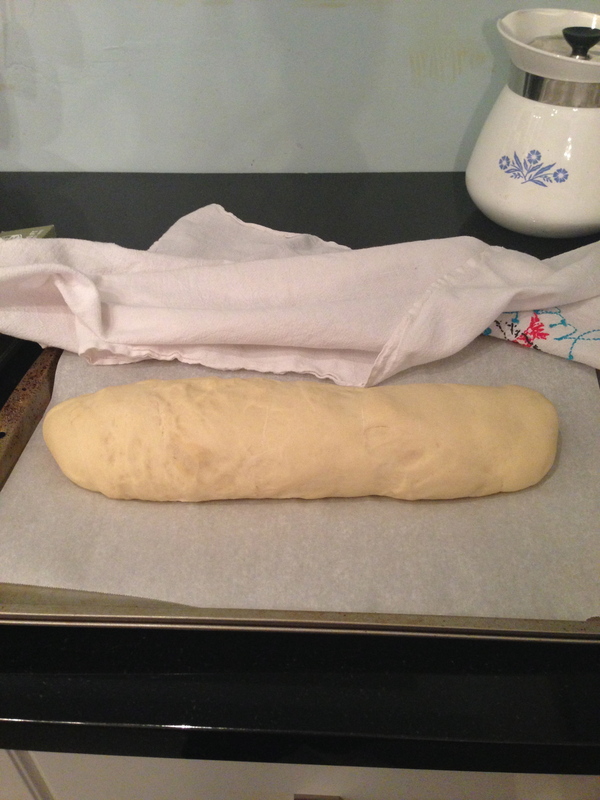 Last week, I set out to create the gondola on my own, which meant, baking some Avanti’s bread. My dad has a sweet bread recipe that he makes all the time that is kind of like Avanti’s bread, but sweeter. He mailed me the recipe almost two years ago and because it looked complicated, I’ve been putting off making it. I have never baked bread before. In 2011, I was on a bagel-making kick all winter and then got kind of burnt out on the bread-making…which is why I added “make bread” to my 2014 goal list…it was time to try some more breads. Dad’s recipe still felt complicated (it involves scalding milk) so I googled “Avanti’s bread” to see if I could find another recipe. I found this one…it was the winner. Everything on Thursday afternoon pointed to me not baking bread. I couldn’t find the yeast (I know we had some leftover from “bagel days”…it was probably expired.). I got home from buying yeast and realized Naoto had used up all of our oil for Christmas tonkatsu. Our neighbors had oil but it was too old to use. Then my Kitchen Aid mixer died. Twice. During the kneading process. I had to use my hands while the motor cooled off. The dough didn’t feel right so I added a couple of tablespoons of water and it felt better…but I really had to idea through the whole process if anything was going to taste good. Did the yeast activate properly? Did I put in nine cups of flour or ten? Was overworking the dough going to make my bread tough and chewy? Was starting and stopping the kneading so many times going to mess up the yeast? 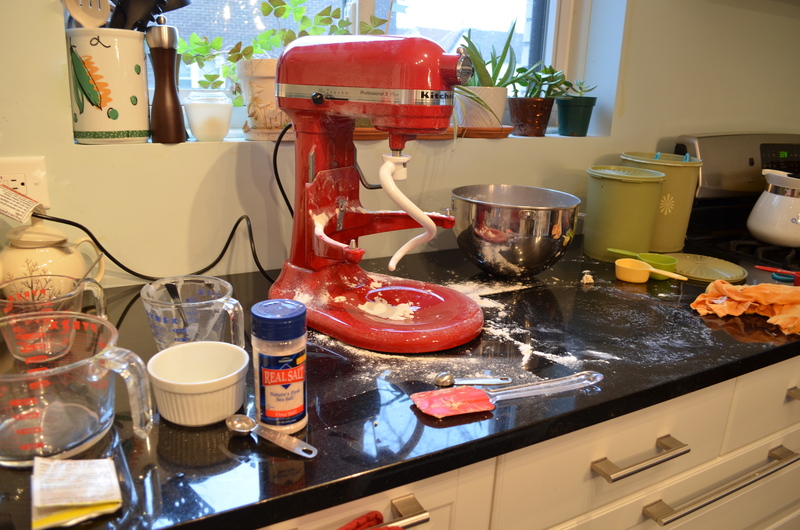 Was all that flour that flew out of the mixer important? Was using butter in place of oil going to ruin everything? It turns out…bread baking is less about an exact recipe and more of a feeling…this dough is supposed to be a little bit sticky and very elastic. This dough doubles in size when it rises. This bread is done when it sounds hollow. These tips in the recipe made me feel better about my steps along the way. And, encouragement from experienced bread bakers on Twitter and on the phone (I called my dad three times) helped me feel like I was on the right track as I went through the process. I have to say, after all that worrying and hand-wringing…my bread turned out perfectly…I was jumping up and down in the kitchen. Beginner’s luck. 10-11 cups flour Activate the yeast according to the package. 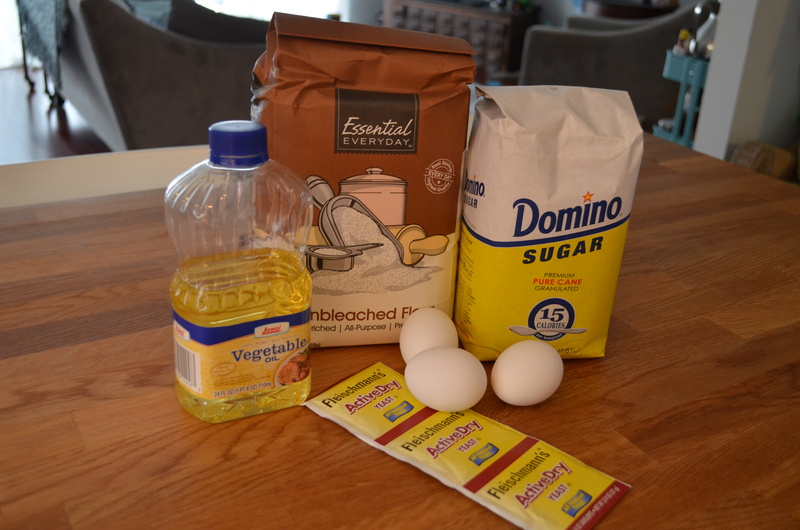 Once activated, add the rest of the ingredients to the bowl of a stand mixer. Once you get to the flour, slow down and count out cups carefully. After two cups, start mixer and slowly add the rest of the flour. Stop at the tenth cup and determine if you need the eleventh. (I only needed ten in my dry winter apartment.) 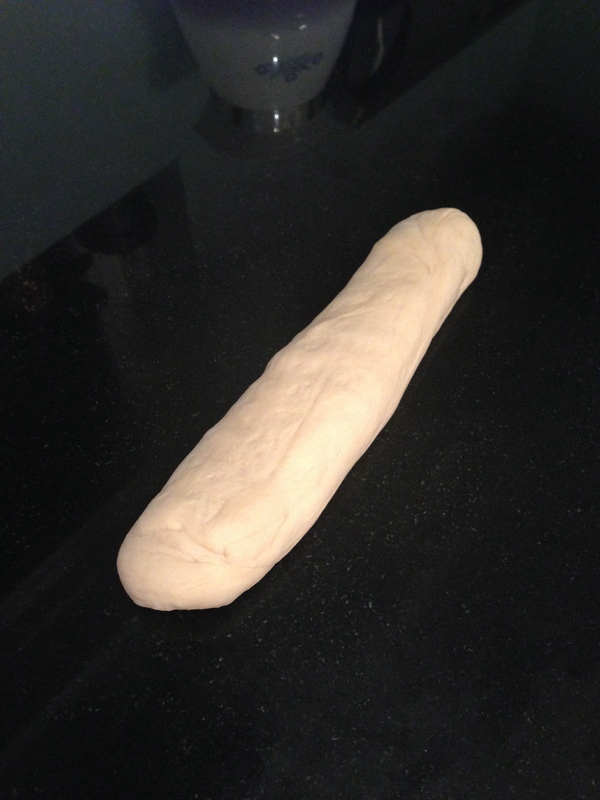 Once the dough is smooth and elastic, it’s done. 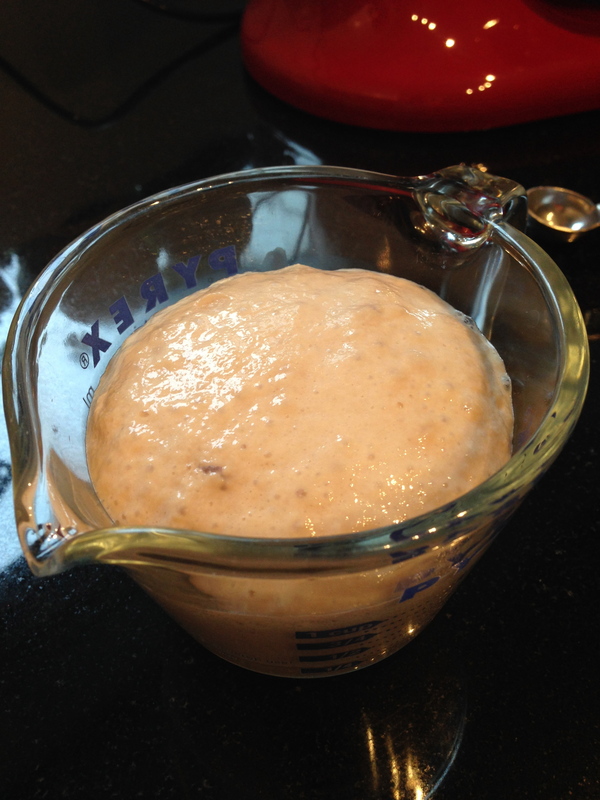 (Confession: my dough was a tiny bit lumpy but very elastic…) Place the big ball of dough in a greased bowl, flip it over in the bowl and cover with a tea towel. 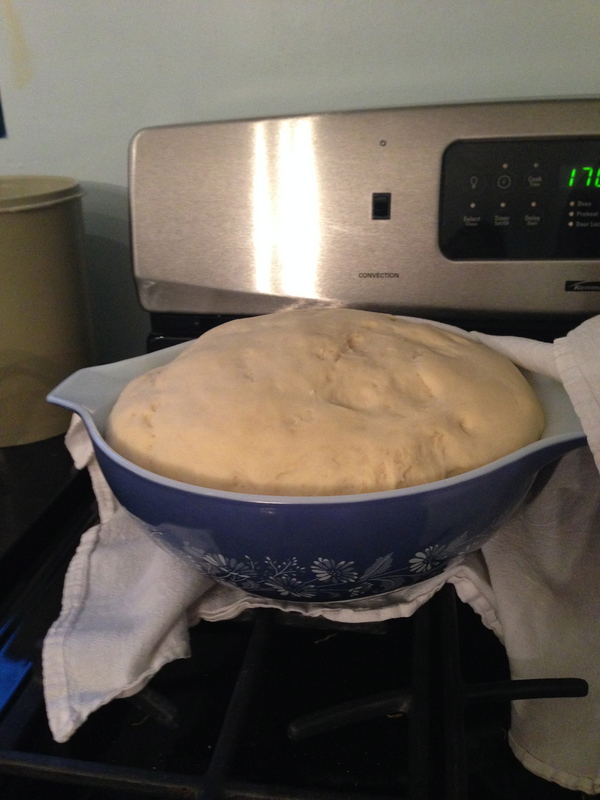 Place the bowl of dough in a warm spot in your kitchen. (I feel like my kitchen is chilly, so I turned my oven on low and set the bowl on the stove top. The dough rose like a champ!) After 1 1/2-2 hours, it should double in size. After the first rise, punch down the dough in the bowl, flip it over again and re-cover. Put it back in the warm part of the kitchen. After another 30-45 minutes, it should double in size again. Take the dough out of the bowl and divide it into six equal portions. They should each be the size of a grapefruit. (Mine were not perfectly equal, as you can see.) Cover these and let them rise for 10 minutes. 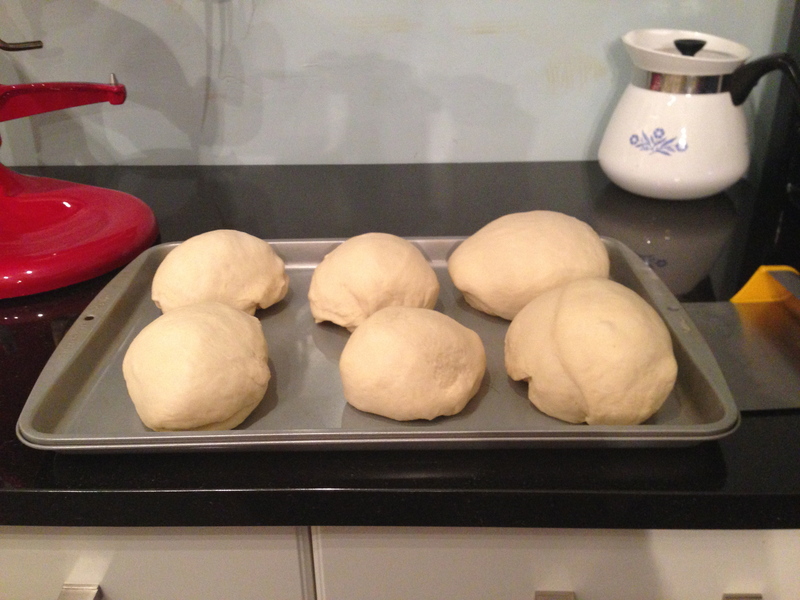 After 10 minutes, flatten each ball of dough, pressing out the air. You will hear some air escaping…it’s a good sign. Then form the loaves. Place the loaves on a prepared baking sheet (I used parchment paper, but a greased & floured baking sheet works, too.) Cover loaves and let them rise for another hour. Use this time to pre-heat the oven to 350°F. Finally, it’s time to bake! Bake for 20-25 minutes. I baked mine three loaves at a time and 23 minutes was the magic number. The first batch seemed ready (it was a nice shade of brown and sounded pretty hollow) after 18 minutes, but when we cut into the “test loaf” you could tell it was still a little gooey/sticky/undone inside. After five more minutes (at the 23 minute mark), everything was perfect–the tops were golden and they really sounded hollow! The biggest thing I would change is to make the loaves a little skinnier and longer next time…they were kind of short and plump, but made excellent sandwiches anyway. We sampled the bread during Hasegawa Happy Hour. It got our friend Karen’s approval for authentic Avanti’s taste. (She went to ISU and loves Avanti’s too.) 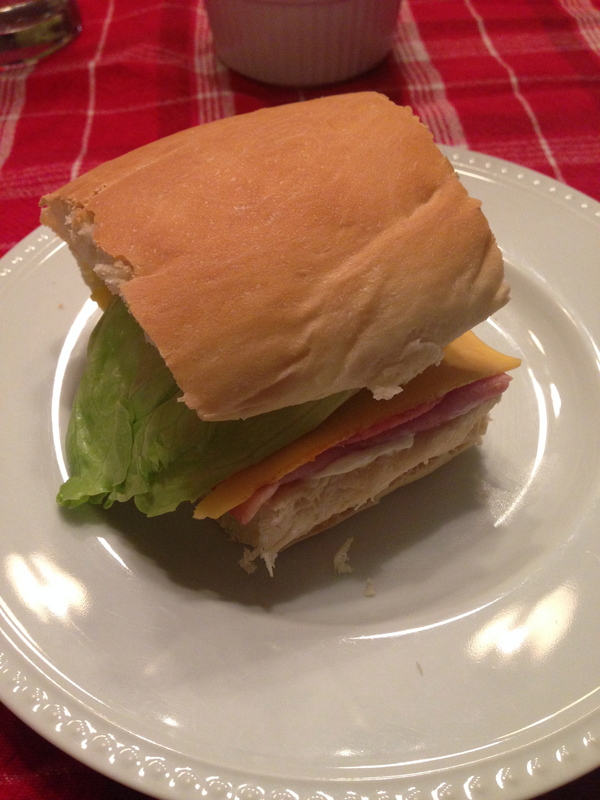 For dinner, we made gondolas and walked down memory lane…Avanti’s bread with ham, salami, American cheese, lettuce and mayo…the best taste memory ever. ***This post is part of a series of Homemaker’s Challenges: activities that get me (and hopefully you, too!) out of the everyday routine of cooking, cleaning and laundry and into a routine of trying something new and experimental. I’d love it if you’d play along! Looks like a delicious ending to a challenging day! I loved Avanti’s too when I was at ISU! 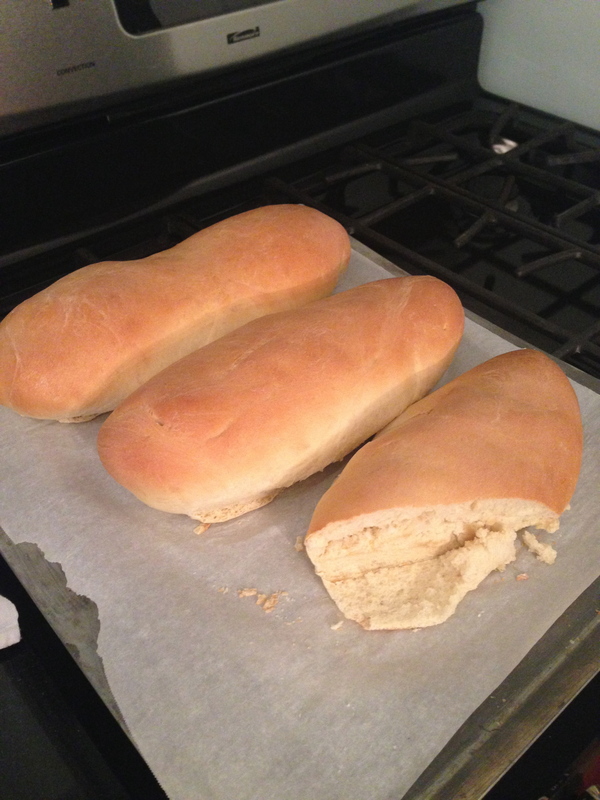 I have never made bread and not sure I’d be so good at it…but your post makes me want to try!